Ibizan Hounds have slender, graceful, medium-sized frames covered in smooth or wiry coats that range in color from red to tan. Their long, clean-cut heads have clear oval-shaped eyes, long erect ears and flesh-colored noses. Like Pharaoh Hounds, they tend to blush when they get happy. They have lean necks, straight backs and medium-length tails that hang low. Overall, Ibizan Hounds have a sleek and powerful look. 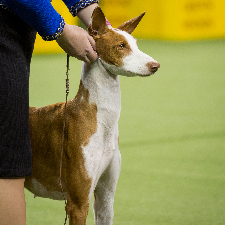 Ibizan Hound. Photography by Kayla Bertagnolli, as captured at the 2018 Westminster Kennel Club Dog Show. Ibizan Hounds are polite and friendly. Though sometimes reserved with strangers, they are playful, outgoing and affectionate with family members. Ibizan Hounds are quick and intelligent, learning new commands with ease. They are clean and quiet, easily adapting to apartment life; however, Ibizan Hounds need lots of exercise to stay physically and mentally sharp. Just don’t forget the leash when you go out: These dogs are fast. Ibizan Hounds can live as long as 13 years with relatively few genetic health issues. Some may develop allergies and seizures. Both the shorthaired and the wire-haired Ibizan Hounds are easy to groom, needing only an occasional brushing. 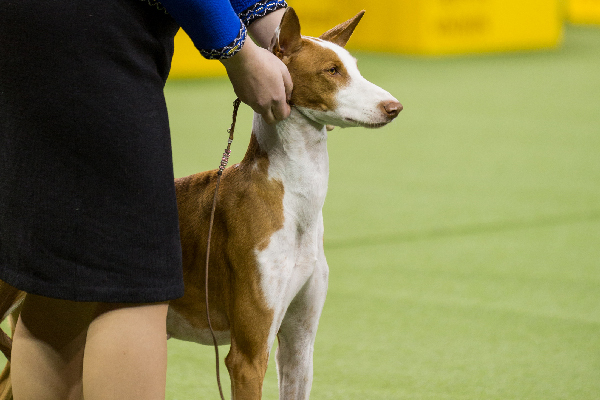 The Ibizan Hound is one of the oldest domesticated dog breeds, cherished thousands of years ago by Egyptian pharaohs and royalty for their warm companionship and dependable hunting instincts. Traders brought these handsome dogs to the Mediterranean island of Ibiza, where the breed was preserved and solidified for several thousand years.